We wanted to create the highest quality set of carabiners. Most brands offer a carabiner that is 12 kN rated so we went ahead and created a carabiner that is twice as strong with a 24 kN rating! We design and test our products to ensure ultimate quality. 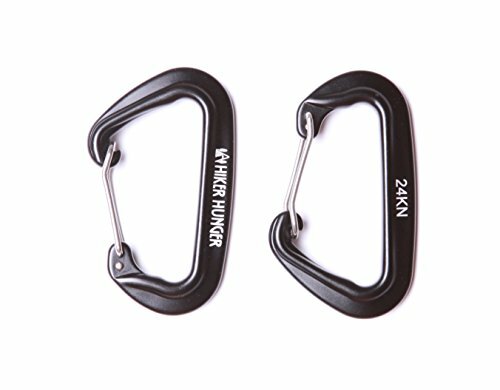 However, for mountain climbing, you will want to find a carabiner that is rated over 24 kN! Have any other questions? Send us a message and we'd love to chat! Join the Hiker Hunger family! ♦ Weight limit: 5,395+ lbs each carabiner! ♦ We are a small family business consisting of avid outdoor enthusiasts. All of our products are designed, created, and vigorously tested in order to offer premium products at affordable prices! ♦ With our guarantee, you have nothing to worry about when purchasing a product from us. Our goal is to make you feel like family. If there is ever something you need, just reach out. We love hearing from our customers and will always do our best to put a smile on your face! ♦ We make our outdoor products for everyone to enjoy: hikers, backpackers, college students, nappers, beach goers, and everyone in between! ULTIMATE STRENGTH & DURABILITY - With a rating of 24 kN, our biners are double the strength as others available on Amazon and for the same price! Each carabiner can withstand over 5,395+ lbs! We use rust free aircraft grade aluminum alloy so you'll never need to replace your carabiners - rain or shine - you can use them anytime! This is the most superior carabiner set available. ULTRA LIGHT & COMPACT - Each carabiner weighs in at only 1.25 ounces each! They are small and compact sizing at 3.5" by 2" by .25" inches! These are very handy when traveling, hiking, cycling, trekking, or even fishing and hunting! They have a general utility use and are fantastic keychains! NO SHARP EDGES - We designed a wiregate opening free of sharp edges so you will no longer need to worry about puncturing, ripping, or snagging your hammock, straps, backpack, clothes, tarp, or anything else! Enjoy the safest, snag free carabiners available! VERSATILE & QUICK TO USE - Not only will these carabiners work with all hammock suspension systems, but you can also use these for any outdoor activity! From clipping camping gear and accessories to your backpack to adventuring, these carabiners allow you to easily open and close without any trouble. 100% MONEY BACK GUARANTEE! Let us make it an easy choice! We offer an easy money back promise! If you do not like your carabiners or have any issues, we will refund instantly, no questions asked! As a small family business, we make sure that all of our customers, and we mean ALL, are 110% satisfied! Don't take just our word for it! Our reputation and other products speak for themselves! If you have any questions about this product by Hiker Hunger, contact us by completing and submitting the form below. If you are looking for a specif part number, please include it with your message.